Notes: For the squats, prioritize keeping the chest and elbows tall and drive those knees out! For the presses, we want to work on some possible strength asymmetries between the left and right arm and focus on a solid overhead position by holding each rep for a full second at the top. Start light and focus on good movement pattern! 6X3/6 FS/BS @ 85% (of 1RM Front Squat) – rest 60 sec. Notes: New rep scheme! Be sure to mobilize and prepare for this kind of volume. With this weight and volume the bar is going to want to break down your thoracic position. Be sure to mobilize and prioritize good movement patterns during your warm up sets! Notes: The ring rows and dips are not just for time, focus on form and getting stronger! For the dips, use benches or boxes as needed to prioritize depth and lockout. If you want to do dips on the rings, be sure to turn out at the top with a true lockout. Remember we have ‘Elizabeth’ this Friday, which will have 45 dips! Notes: If you can do muscle-ups, but 30 reps is too many, perform as many as you can until 12:00 and then finish with your final run. Otherwise, don’t be afraid to perform the classic scale above and reinforce those quality positions. “Similarly, master the basics of gymnastics: pull-ups, dips, rope climb, push-ups, sit-ups, presses to handstand, pirouettes, flips, splits, and holds.” I’m waiting to see those pirouettes in the program. Especially in a WOD. Flips would be cool too. I couldn’t agree more! They are quoting from our “World Class Fitness in 100 Words” (located on the right side of our blog in case you have never read it). Sure there are plenty of videos out there with elite level CF athletes doing workouts that include back flips, examples HERE, HERE and HERE, but this is not what we see in normal Crossfit gym programming. Much like our approach and use of the Olympic Lifts in our program, we believe these ‘basic’ gymnastic movements should be seen as a normal part of athletic training. But too often we see people thinking, “Why should I be doing back flips (or snatching) when I just want to get in shape?” Well, first of all, because it’s fun!! Secondly, the point is to understand what it means to be ‘in shape’ or fit. Our goal is to remind you that these movements are not just for select few elite athletes, but for anyone to pursue and enjoy! We want to remind you that if you begin to use your body like an athlete and pursue these abilities, you will find greater success in achieving your Health and Fitness goals (and have a lot more fun doing it)! Everything is Everything Sidenote: Check out the similarities in body position between an Olympic Lift and a Back Flip. Gymnastic coach Carl Paoli states that if you can power clean your bodyweight, you can easily do a back flip…just saying! 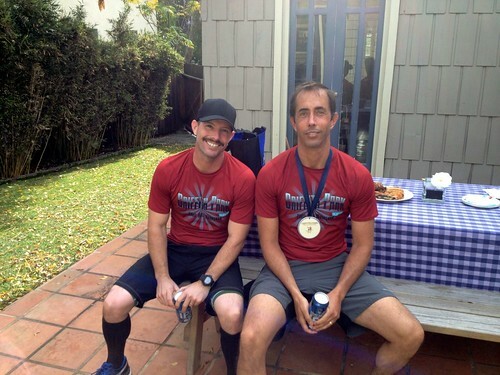 Congrats to Frisco and Rob for running the Griffith Park Half Marathon last week, with over 5000 ft of elevation gain and descent!